There’s a reason blogging is so valuable – it builds trust with prospects and customers, drives traffic, helps you establish authority, and generates new leads. B2B marketers who consistently blog bring in 67% more leads than those who don’t. It’s shocking that so many community banks aren’t taking advantage of this. Especially since strong, personal relationships are the core of community banking – and by 2020, customers will maintain almost all of their relationships without speaking with a human. 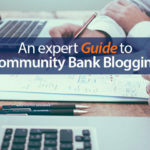 One of the essential components of community bank blogging is understanding your audience. More specifically, who they are and where they stand in the buyer’s journey. The goal is to match the right content with the right people at the right time. In order to define who your audience is, your bank needs to establish buyer personas. Buyer personas are made-up representations of who your prospective customers are, and what they think and do as they research banking related topics, products and services. Buyer personas outline a prospect’s attitude, challenges, role, tendencies, and the [most important] factors they consider when making a buying decision. As an example; say you create a persona named Business-Owner Bob. By creating this persona, you are able to direct Bob towards a solution that speaks to his specific challenges as a business owner all the while building trust in the process. (See our in-depth guide on How to Create Buyer Personas). Understanding where people might be in the buyer’s journey and tailoring your content to meet them is fundamental to success. There are three main stages your prospects go through during their quest to solve a problem: The Awareness Stage, The Consideration Stage, and The Decision Stage. The key is to create helpful content that meets people where they are in the process. The (counter-intuitive) goal is to educate, not to sell yourself – especially if they are involved in the Awareness or Consideration stages. As an illustration: somebody who is reading a blog post titled “Is a small business loan a good idea” is not ready to “See our best small business loans!“. Whereas someone who is reading your post on “Comparing Best Small Business Loans From Community Banks” probably is. The Awareness Stage is defined by someone who is experiencing symptoms of a problem or situation. In other words, they aren’t happy where they are, but haven’t broken down the problem or given it a label yet. For example, a high school student gets their first job and realizes they need to set up a bank account to get paid – there’s a great opportunity. You could write a post on “How to set-up your first bank account really fast”. Considering only 23% of Americans are happy with their current bank – providing helpful content around the Awareness Stage presents a huge opportunity for community banks. It’s especially an important stage for bringing in millennial customers, who are almost twice as likely to switch banks than any other age group. These are just two obvious areas your community bank can help solve the everyday problems people face around their personal finances. This is when your prospect has clearly defined and given a name to their problem or opportunity. Here’s what the consideration stage sounds like: “I’m moving to a new area and need to find a new bank,” or “I’m not satisfied with my bank’s customer service, and I’m looking to switch.” These are indicators that you, the community bank, can target solution-based blog posts to help your prospect consider their options. 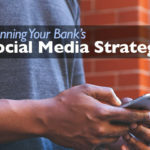 Now is the time for your bank to start blogging. 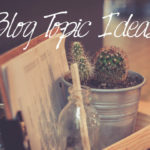 I’ve given you blog topics to write about for each stage of the buyer’s journey, so your bank can hit the ground running. It’s simply a matter of creating consistent, genuinely-helpful content for your website visitors and customers. I’m going to leave you with a few statistics to consider. Happy blogging! Inbound marketing intern and web designer at Catch22. I’m an entrepreneur at heart - completely hooked by the digital world. Get in touch with me at Peter@catch22marketing.com.